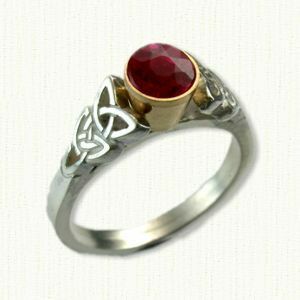 Double Vanessa Engagement Rings - custom celtic engagement rings w/ gemstones, diamonds @ best prices! Description: The 'Double Vanessa' engagement ring is a Narrow Bridged pierced Triangle Knot mounting measuring 6mm near the stone with a 2.5mm shank. Most any size, shape and color gemstone may be used with this mounting. Available in 14kt, 18kt and platinum ( pricing ). Also available with bezel set Round stones (Only round) at an additional fee. Visit our Available Diamonds and Gemstones page to view photos of in stock stones. Double Vanessa is always prong set unless the customer requests Bezel setting when ordering.